There's nothing I fancy watching on the television, so I thought I'd make a start on the second part of travels through my village and early life. The birth certificate gives some legitimacy to my life. To corrupt Descartes, "I am, therefore I exist". The certificate shows that I was born at Croesnewydd Hospital, Wrexham in 1947. 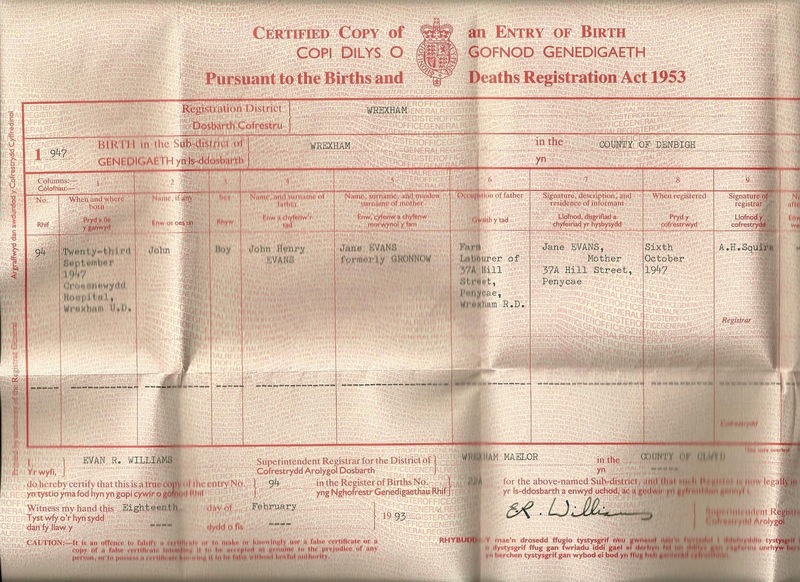 (Pointless information I know, but my birth came 10 months before the launch of the NHS). I find it interesting that Croesnewydd was recorded, as in 1934 it was one of three medical institutions that came together to form the Wrexham Maelor General Hospital (Ysbyty Maelor). The original name for part of the hospital was obviously still being used 13 years after the amalgamation. My parents at the time lived at 37A, Hill Street, which can be seen on the map above. Naturally, on leaving hospital I went to live with them. I can find no photos of the house which was knocked down years ago, and new ones built on the site. It was an old semi-detached two up, two down style cottage which my sister was also born into in March 1951. We shared a room which was the case until I was aged 11. 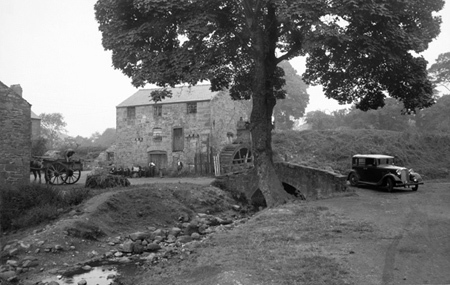 The house was in an area called Pentre, and less than 100 yards behind the house was an old Mill called Pentre Mill, which for many years ground corn. I don't think it was still operating when I was born, but though run down, it was in a picture book setting, by the side of a small stream which drove the mill wheel, and a small road called The Valley. ﻿Edward Schleising wrote a book of poems about Penycae and some of its people, and in 1953 he wrote one about the Mill. The first and last stanzas went like this. A village so small, 'twill hardly count. Both the miller, and his mill, are dead ...". I know it sounds a bit like it could have been written by William McGonagall, but it's sweet none the less. In later years, this area would become an occasional playground. 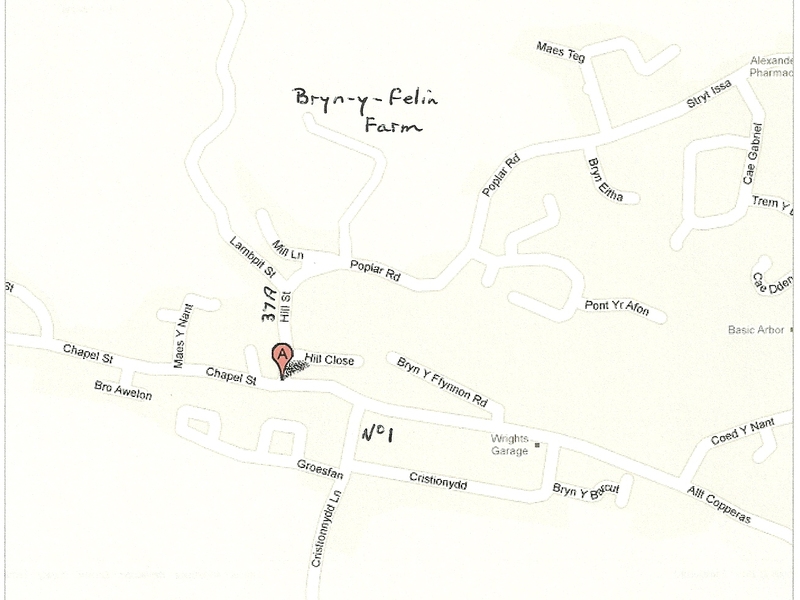 We lived at Hill Street until 1953, when at the age of 5, we moved to a small farm on the edge of the village called Bryn-y-felin. 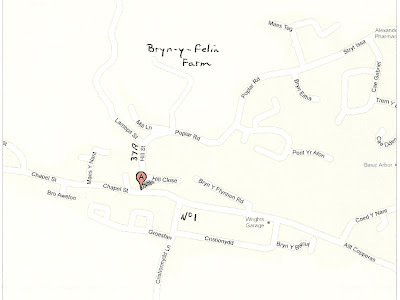 ﻿The lane leading up to the farm was only a short distance from Hill Street, and was known as the Dark Lane. It was aptly named. It was only about 100 yards long, followed by another three or four hundred yards of track to the farmhouse. The lane was cut into the countryside, which meant very high sides to the fields above, then trees on either side which met together in the middle to form what was in effect a dark tunnel. Believe me when I say that I hated that 100 yard walk through the Dark Lane. I confess that I have always had a certain fear of the dark, and walking, particularly from school in the winter months was agony. You've probably seen those t-shirts that say, "You're not paranoid. People really are out to get you". That's how it felt. There was always someone waiting to jump out of the hedgerow to get me. But of course it never happened. To this day I'm still constantly looking around me when I'm walking in the darkness. I blame that bloody lane. Bryn-y-felin, I learnt from my sister was owned by my Dad's best man, who also helped me pass my driving test, as mentioned in part one. It was a long, single story farmhouse with two bedrooms, a living room and a kitchen. The toilet was outside, which meant that in winter, you only went when you really had to go. I'm surprised that none of the family ever suffered from bladder disease, through holding it in for so long. God, like so many others, we must have been a hardy lot before 'civilisation' softened us. Bath night was in a tin bath in front of an open fire, but unlike the toilet arrangements, it had the merit of being warm. I wasn't a lover of the farm I confess. I didn't mind the open space and the green grass, but the few animals were a different matter. Shock, horror, but to this day I can't consider myself to be an animal lover. 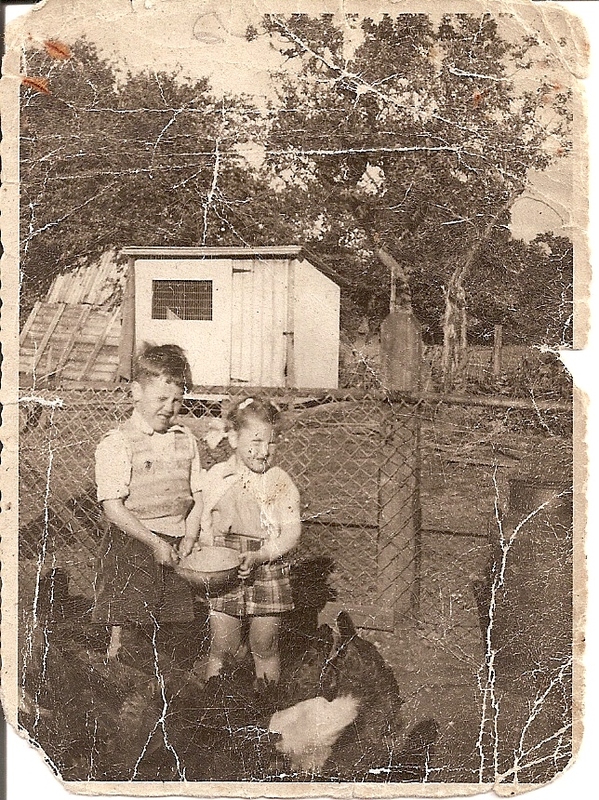 From the picture opposite, it was obviously the job of my sister and I to feed the chickens and collect the eggs. The only job I think I didn't mind doing was part of the summer harvest. I have a clear recollection of working with other small holdings adjacent to ours, gathering in the hay. I don't know if this was considered to be a cooperative, or that people just helped each other out. I wish there were photos of those times in glorious summer weather sitting on the hay having lunch. It was one of those few occasions when I didn't mind being a "farmer". There were two small wooded areas next to the farm, and I can still today remember the smell and sight of carpets of bluebells as far as the eye could see. During the bluebell season, I would often take myself off to the nearest wood, and return home with armfuls of flowers for the house. I have no idea if Mum ever tired of them, but I have no memory of them ever being turned away. This photograph is obviously of a family day out somewhere by the seaside. Within a couple of years my father would be diagnosed with Leukemia. We saw little of him in the last year or two of his life, as he spent so much time in hospital. I can only imagine the pressure on Mum, as she worried about Dad, as well as run a farm and look after two young children. I only hope that we two children tried our best not to be too troublesome. Looking back on history, it was apparent to Mum that Dad was not going to be cured, and that we would have to move from Bryn-y-felin and back into the village proper. 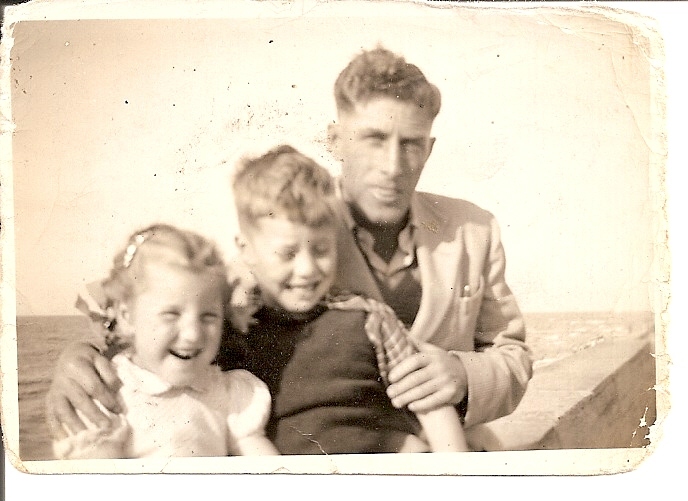 Dad died on the 27th September 1958, aged 41. This was four days after my 11th birthday. He never did see our new home. 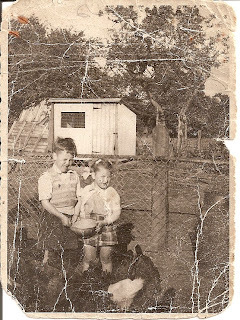 So in 1958 we moved to 1, Cristionydd, where I lived until I left the village 10 years later. My Mother continued to live there until she died in 2005. I apologise for the small picture opposite, but trying to enlarge it only makes it lose focus (I wish I was more gifted). There were two Council housing estates in the upper village. Cristionydd on the right of the picture, and Groesfan on the left. Our house is the one at the top right of the picture. It was a three bedroom, two living room, semi-detached house, with whoopee, my own bedroom, and indoor toilet and separate bathroom. It also came with a nice garden, back and front. The only drawback was that it was part of a line of houses built over a coal seam, a long way below, but which made it liable to subsidence. In later years the house was underpinned with tonnes of concrete. Apart from that, it was a sound, quality Council house. Long after I left home, Mum succumbed to the offer of double glazing and central heating, but during the time I lived there we made do with one open fire in the living room. Going to bed was a speedy exercise, as the rest of the house was freezing, which Mum never seemed to notice as much as I did. It was a joyful day when I moved into a house with central heating, though that was a few years away. I know, wuss. The bathroom did have an electric wall heater, which today would be condemned as unsafe, and an accident waiting to happen. However, it was used with glee. My mother lived in that Council house for 47 years, and though the Council offered to move her to smaller property so that a family could have the house, she remained adamant that she was staying in her home. Offers to sell her the home were also unfruitful, as she had no intention of being an owner/occupier. She loved the rent man calling, before that was stopped, and loved telephoning the Council to get repairs done. These were little but important matters. Council housing gave peace and security to so many people. I was always opposed to the selling off of Council houses and the right to buy schemes. Housing Associations may have taken over many properties previously owned by local Councils, but it is not the same. I still believe that it is the duty of the State to provide adequate housing to those who cannot afford to get them elsewhere. My Mother benefited from this, and so should others, but those days have gone, and young people growing up in the village, with little going for them, have no hope of finding affordable housing. (You just can't resist a political statement can you John?). Perhaps we'll finish there, and continue the journey in part three at a later stage. Thanks Kelvin, I also enjoyed reading the green4care website. Good luck with that work.